My personal recommendation: buy everything that Wuthering Heights has produced, at least from To Travel for Evermore to the present and current release Salt. Still propelled by founder and principal player, Erik Ravn, this Danish band defies categorization. With Wuthering Heights you will find diverse elements: prog metal, power metal, folk metal, bits of thrash, and pure classic melodic heavy metal. An amalgamation, certainly, and Wuthering Heights is better for it, and so are we. Why? Because with the creativity there's an authentic intensity and enthusiasm. You can hear it The Desperate Poet, The Mad Sailor, or Tears, where those eclectic elements are combined and pushed with beauty and fervor. The brilliance is in the arrangements, pure and simple. Nevertheless, some may take issue with Nils Patrik Johansson vocal performance. I've been a fan of Mr. Johansson for some time, from his work with Wuthering Heights to Astral Doors to Lion's Share. However, if you listen carefully, Johansson always sounds the same on most every recording, unless there are moments when he doesn't have to sing metal (as on Weather the Storm and Water of Life, by example). Though I'm still a huge fan, I'm beginning to think Nils is becoming like a character actor, pigeon-holed into a predictable performance. He needs to expand his range, and find more diverse opportunities. Still, in Wuthering Heights' milieu, Mr. Johansson delivers the goods. Maybe he should forget his other projects and stay here. The only thing left to do here is to pick my favorites on Salt. But that is an extremely difficult task. Not withstanding its quasi-maritime, dark, and apocalyptic themes, I'm still compelled by the music. Remembering the aforementioned tracks add also Water of Life and Lost at Sea. Wuthering Height's Salt is intense, creative, and inspiring: some of the best eclectic and progressive metal this year. Strongly recommended! 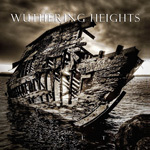 Wuthering Height's Salt is intense, creative, and inspiring: some of the best eclectic and progressive metal this year. Strongly recommended!